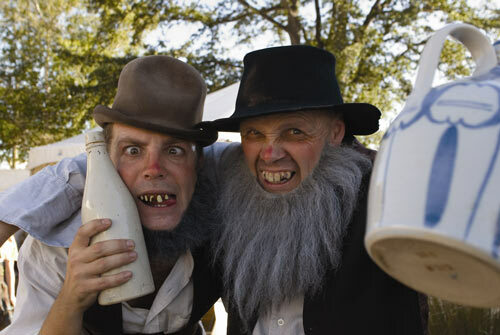 Comedy duo ‘Geezers’ (Greg Ellis and Patrick Duffy) perform at the 2006 Hokonui Moonshiners’ Festival, in the guise of two moonshiners. The festival, held annually in Gore each summer, commemorates the illegal distilling of liquor in the Hokonui Hills in the first half of the 20th century when the district was ‘dry’. Festival-goers can sample not just whisky but wine, beer, and a variety of foods. By the end of the day some are clearly the worse for wear, or perhaps whisky.